“For Flash Player releases after 11.2, the Flash Player browser plugin for Linux will only be available via the “Pepper” API as part of the Google Chrome browser distribution and will no longer be available as a direct download from Adobe. Adobe will continue to provide security updates to non-Pepper distributions of Flash Player 11.2 on Linux for five years from its release.” said in a blog post by Adobe. If you’re using Chromium web browser instead of Google Chrome, this simple tutorial will show you how to install the Pepper Flash Player using a PPA repository. Hit “Ctrl+Alt+T” to open a terminal, copy and paste following commands and run one by one to add the ppa and install Pepper Flash from Google Chrome. It supports Ubuntu 13.04 Raring, 12.10 Quantal, and 12.04 Precise. 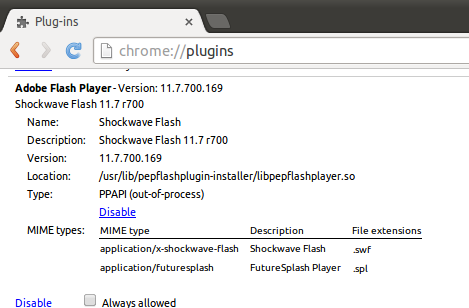 1 user responded in " Install Pepper Flash for Chromium in Ubuntu 13.04/12.10/12.04 "